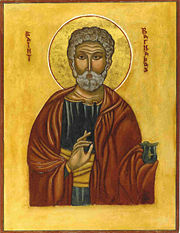 Saint Barnabas, the companion of the Apostle Paul, to whom one of the writings of the Apostolic Fathers is attributed. The Apostolic Fathers were a group of early Christian leaders believed to know the Apostles personally. The term also refers to the collection of Christian writings attributed to these men from the late first century C.E. and the first half of the second century C.E. The authors are traditionally acknowledged as leaders in the early church whose writings were not included in the New Testament biblical canon. Evidence exists that some of these works were once bound as part of the New Testament scriptures in some churches. However, several of the works are actually anonymous, and their attributions have been challenged by recent scholarship. The term “Apostolic Fathers,” has been used since the seventeenth century to emphasize that these authors were thought of as being of the generation that had personal contact with the Apostles. Thus they provide a link between the Apostles who knew Jesus of Nazareth and the later generation of Christian apologists and defenders of orthodox authority known as the Church Fathers. Study of the Apostolic Fathers has yielded important insights into the formation of the early Christian tradition, the emergence of the bishop's office, the development of a concept of Christian scriptures, and the emergence of "proto-orthodox" Christian theology. Polycarp of Smyrna, one of the Apostolic Fathers, depicted with a book as a symbol of his writings. The Apostolic Fathers, as persons, are distinguished from other Christian (or semi-Christian) authors of the same period in that their practices and theology largely fell within those developing traditions of orthodox Pauline Christianity that became the mainstream. They thus represent an emerging "proto-orthodoxy," as opposed to heretical writers of the same or slightly later period. By the fourth century, mainstream Nicene Christianity was in a position to use the power of the Roman state in declaring significantly different interpretations as heretical. The writings of the Apostolic Fathers are in a number of genres, some being letters, sermons, apocalyptic prophecy, a biography of a martyr, and a guide to moral and liturgy practice. Although a few of the opinions expounded by the Apostolic Fathers are no longer considered entirely orthodox, their writings in general provide important evidence for the "proto-orthodox" strain of early Christianity, as well as its intellectual history. Shortly after the time of the Apostolic Fathers, several Christian authors addressed their works to people beyond the Christian community (and sometimes to fellow Christians) and defended the Christian religion against paganism, including Justin Martyr, Irenaeus, and Tertullian. These are considered Apologists. A number of other authors, now only known in fragments, such as Papias and Hegesippus, were more exclusively concerned with the apostolic continuity of the individual churches and their histories. The extant writings from the early Christian tradition that are not classed in those of the Apostolic Fathers include the apocryphal gospels, much of the pseudepigrapha, and the writings of unorthodox leaders or heretics. Much of this type of literature was intentionally destroyed by church authorities, although some fragments survived in the writings of orthodox teachers who quoted heretical writers in order to refute them. Most of the apocryphal gospels and pseudepigrapha are, however, somewhat later writings than the Apostolic Fathers. A number of the New Testament Apocrypha were discovered throughout the centuries, and a major discovery, known as the Nag Hammadi library, was unearthed in the mid-twentieth century in Egypt. One formerly lost work which was recently discovered was the Gospel of Thomas, which may be at least as early as some of the Apostolic Fathers themselves, and is thought to be quoted by the apostolic Epistle to Diognetus. Epistle to Diognetus—The Epistle of Mathetes to Diognetus is traditionally the earliest example of Christian apologetics, specifically defending Christianity from its accusers. Language and other textual evidence date the work to the late second century and have caused it to be dropped in some collections as not truly "apostolic." First Epistle of Clement—One of the earliest Christian documents outside the New Testament, this letter is addressed from an unnamed person representing the church at Rome to the church at Corinth. It objects to the deposition of certain presbyters (elders) by the Corinthian church and is important as an early assertion of Roman primacy. Didache—Not rediscovered until the nineteenth century, this handbook of moral instruction and liturgical practice is also known as the "Teaching of the Twelve" (Apostles). More in the Jewish-Christian tradition than the other works in the collection, it emphasizes ethical behavior, proper worship and ceremonial practices, and also gives instructions about discerning false prophets, hoping that itinerant true prophets will settle in local churches perhaps to serve as bishops. 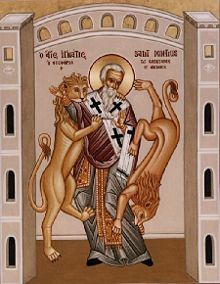 Icon of the martyrdom of Saint Ignatius of Antioch. Epistle of Barnabas—Also called Pseudo-Barnabas, this is an anonymous treatise or sermon attributed to Paul's companion Barnabas, somewhat in the tradition of the Epistle to the Hebrews. It warns Christians to avoid Judaistic attitudes, but goes further than Hebrews by affirming that God's covenant belongs to Christians alone, and was never in fact received by the Jews. Epistles of Ignatius—Seven short letters of the future martyr, Bishop Ignatius of Antioch, to various other churches, particularly important in understanding the emerging of the "monarchical episcopacy," the institution of a single bishop as the central authority in each city's church, a principle which Ignatius strongly endorses. Epistle of Polycarp—A letter from Polycarp, the bishop of Smryna and future martyr, to the Philippian church, which many scholars believe to be a cover-letter sent with Polycarp's collection of the letters of Ignatius, although it deals primarily with other subjects, such as praise for the Apostle Paul and an exhortation against heresy. Martyrdom of Polycarp—An account of Polycarp's glorious martyrdom at the age of 86, this work is the first known description of a martyrdom outside of the New Testament. Shepherd of Hermas—A work of apocalyptic literature and prophecy by Hermas of Rome, widely read publicly in the early churches, predicting the imminent return of Christ and offering one last chance for Christians to repent of post-baptismal sins. Papias—The fragments from the writings of Papias, the bishop of Hierapolis (modern Pamukkale, Turkey), which have survived as quotations by later writers. Quadratus of Athens—Considered by some as an apologist rather than one of the Apostolic Fathers, Quadratus addressed a discourse to the Roman Emperor Hadrian, only a fragment of which survives. The list of Apostolic Fathers has varied. Official inclusion is based strictly on church tradition, but literary criticism resulted in the removal of some writings formerly considered as second century. Of all the writings rediscovered in the modern era, only the Didache, discovered in the 1880s, has been added to the list. This page was last modified on 9 April 2016, at 16:21.